Following on from my explorations of Tregothnan’s Classic Tea, I also had a chance to find out how their Earl Grey stands up to the other Earl Grey blends out there. As mentioned in my previous article, the Tregothnan teas currently being stocked by Waitrose appear only to be sold in bagged form. For the Classic Tea this did not particularly bother me; however, I do prefer most of my other teas loose – a rule to which Earl Grey is no exception. Nevertheless, I wanted to try Tregothnan’s Earl Grey, and decided that a tea bag was not going to come between me and my tea tasting. They go about fulfilling this ambition by combining tea leaves from the Tregothnan estate with Assam leaves and pure bergamot oil. Like most black teas, a steep time of 3 minutes should produce a good brew for an Earl Grey, and so this was where I started. Tregothnan’s blend is definitely on the lighter, more fragrant end of the Earl Grey spectrum, but the bergamot flavour was still clear and distinct in this first brew. I prefer my Earl Grey (like all black teas) with a little added milk, and found that this did not compromise or mask the flavors of the pure tea, which is a good sign. For my second brew, I let the tea steep for 4 minutes. This produced a slightly darker brew with a slightly stronger taste. Although the first brew was complemented well by the milk, I found that the stronger brew coped even better with it, producing a more balanced cup. This preference may well reflect the fact that I tend to enjoy stronger black teas, so some tea drinkers might find the lighter steep more to their taste. As a lighter, more subtle blend of flavours than some of the more robust blends out there, Tregothnan’s Earl Grey is better suited as an afternoon tea- at least for my tea drinking preferences. 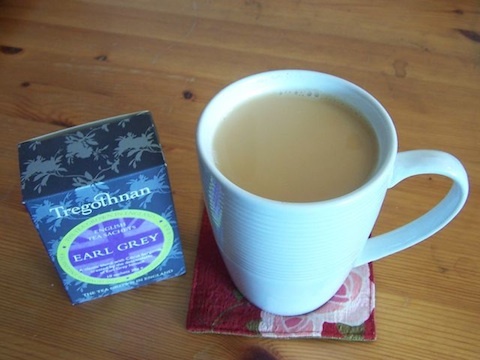 I don’t know about being the ultimate tribute to the original Earl Grey, but I certainly enjoyed my experience of Tregothnan’s Earl Grey tea, and suspect that it would elicit an even more positive reaction in loose form. How Much Does the Tea Leaf Consistency Matter?